If I ever have time for a new hobby, a very enticing possibility involves photographing the flanks of tabby cats. And: Happy eenth Birthday to my amazing daughter! 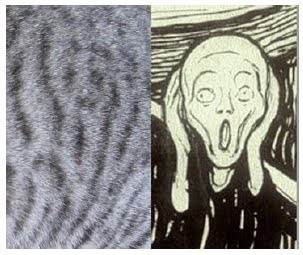 If you hadn't said that the left image is cat fur I would have assumed that it's a TEM image of a polymer film or something. Clearly, I am too into science. It is amazing what a little Photoshop can do. The Scream is one of my favorite paintings - pretty much explains my whole career (as a secondary teacher, grad student and now, postdoc). I am a professional photographer, and this "screams" Photoshop (pun intended). If it were Photoshop I think it'd be much 'better' or at least more obvious. I stared at the image for 10 or 20 seconds before I realized what the point was. So that's where Munch got his idea. Very interesting! I don't think it's Photoshop, either. definitely not Photoshop. And I saw the face in the stripes right away!